I am generally interested in research that can positively impact marine ecosystems through conservation, restoration, and management. Being raised in Hawai'i, I am particularly concerned about our coral reefs. I believe that engaging K-12 students and the general public in conservation issues now will have a lasting impact on future marine resource management. I am grateful to work with a team of distinguished researchers and interact with those who have a vested interest in promoting the health of our coral reefs. Del Rio Torres, L., Chan, C., Wolke, C., Gates, R. and R. Toonen. 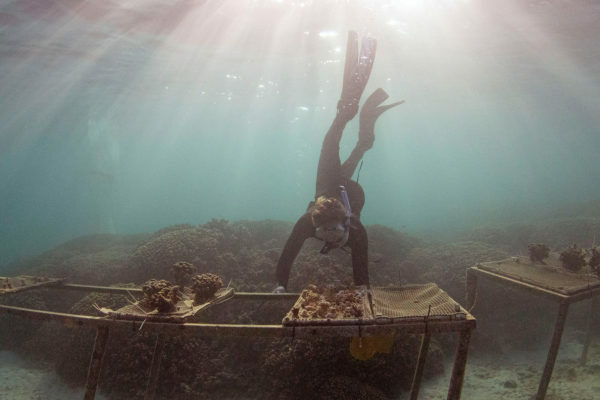 The First Hawai’i Workshop For Coral Restoration & Nurseries. Marine Policy. Hughes, K., 2016. Online Forum for Teachers Developed in partnership with UH STEM Pre-Academy. http://stempreacademy.hawaii.edu/hisci. Withy-Allen, K. and K. Hovel. 2013. California spiny lobster (Panulirus interrruptus) movement behaviour and habitat use: implications for the effectiveness of marine protected areas. Marine and Freshwater Research 64, 359-371. Mainetenance Dredge Project. Carlsbad, CA, USA. 22 pp. Withy-Allen, K., Henderson, H. and K. Merkel. 2012. Baseline Eelgrass Survey and Marine Biological Resources Assessment for the Back Bay Landing Project. Newport Beach, CA, USA. 64 pp. Withy-Allen, K. and K. Hovel. 2009. An introduction to research on the California spiny lobster (Panulirus interruptus). The Lobster Newsletter 22(1): 3-5. Withy-Allen, K. 2007. Life Science Curriculum. Moorea Coral Reef Long Term Ecological Research Program. http://mcr.lternet.edu/education/lessonplans7th.html. †Hughes, K. and RD. Gates. "First Steps to Implementing the Coral Assisted Evolution Project in Hawai'i". Reef Futures Symposium, Key Largo, FL, USA. 2018. §Hughes, K. and RD. Gates. "Super Corals: A Strategy to Save Our Reefs". Hawai'i Conservation Conference, Honolulu, HI, USA. 2018. §Hughes, K. and RD. Gates. "Super Corals: A Strategy to Save Our Reefs". National Marine Educator's Association Conference, Long Beach, CA, USA. 2018. *Hughes, K., *Lenz, B., *Huffmyer, A., *Matsuda, S. and RD. Gates. "Coral Assisted Evolution: Accelerating Naturally Occurring Processes To Enhance Stress Tolerance in Corals". Hawai'i Institute of Marine Biology Science & Snacks Seminar, HI, USA. 2018. †Hughes, K. and R. Gates. "Coral Assisted Evolution". Hawai'i Coral Nursery & Restoration Workshop, HI, USA. 2017. §Hughes, K., Withy, K. and R. Boulay. "Hawai'i Science Career Inspiration Program (HiSCI): Engaging K-12 Students & Teachers in Biomedical/Clinical Health Sciences". NIH SciEd Conference, Washington D.C., USA. 2016. *Withy-Allen, K. and K. Hovel. “Movement and habitat use of California spiny lobsters Panulirus interruptus: implications for marine reserves in Southern California ”. Western Society of Naturalists meeting, San Diego, CA, USA. 2010. *Withy-Allen, K. and K. Hovel. “Movement and habitat use of California spiny lobsters Panulirus interruptus in Southern California kelp forest habitat”. Benthic Ecology Meeting, NC, USA. 2010. *Withy-Allen, K. and K. Hovel. “Movement and habitat use of California spiny lobsters Panulirus interruptus in Southern California kelp forest habitat”. Western Society of Naturalists Meeting, Vancouver, BC. 2008. (Graduate Conference Coordinator).